Duolingo is an online language-learning tool that has reached over 50 million language learners since launching two and a half years ago. In the past year alone, they’ve launched 39 new language courses all with a team of less than 40. How are they scaling so quickly? Community. With hundreds of volunteers, Duolingo was able to empower their community to develop, test, and spread the word about their language courses. This didn’t just happen overnight though – they started small and the community evolved to the point where it could actually develop content alongside the internal team. In this article, we’ll learn how they overcame the challenges of building new language courses a and language-loving community from Kristine Michelsen-Correa, Head of Community at Duolingo. “The Duolingo community is amazing: incredibly supportive, language savvy (of course), and willing to help others learn where they can. They’re all aspirational and kind,” Kristine explains. In the time she has been there (just over two years), Duolingo has grown from 4 million to 50 million language learners all over the world. This is their first time sharing the community story and giving us deep insight into the challenges and triumphs of building a massive community-powered content engine. When Kristine started in her role at Duolingo, “We thought about ways to grow language courses.” They only had so many people on the internal team to develop courses. This was a long, laborious process that was far from scalable. “There were bilingual Duolingo community members who wanted to add languages we never thought we’d be able to offer because of the size of our team.” So they had to think outside the office. They turned to their community members and released what they call the Incubator. The Incubator allows them to scale their entire course-creation engine, bringing in community volunteers and empowering them to teach what they know. The Incubator works in phases, which we’ll describe in more detail. Volunteers apply: There is a formal application process for people interested in volunteering in the Incubator. At this point, they release the course into the world and continue to collect feedback from the community. As they experimented and grew the Incubator, they identified several common challenges that community builders face when developing scalable user-generated content programs and worked to solve each one. Not everyone can contribute in this way, however. It is a high level of involvement. But it’s still important to give people a way to contribute, especially if they’re already clamoring to do it, and to make every contributor feel like their contribution is important. So how do you do this without undermining your own efforts? While Duolingo empowers their volunteers to create course content, they also find other ways for members to get involved. “The community also helps with beta testing by going through the course and catching errors as they’re learning,” Kristine explains. And how did the team even know how best to structure the Incubator and the selection process? They first experimented with forums, which are alive and thriving today in many languages. 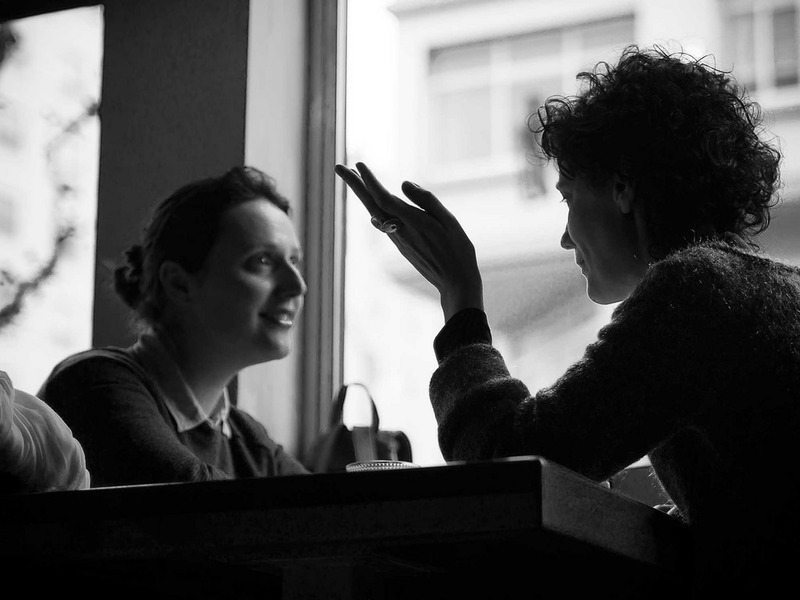 They leverage their talented in-house language experts to help shepherd the contributors: ”A staff member experienced in language course creation becomes a mentor and is assigned to a language team.” This helps streamline the process and facilitate engagement and quality content. Communication among the larger network of volunteers keeps quality high and people motivated. As a result, “There is real community being built between strangers and their link is their passion for languages.” By ensuring that these contributors feel a strong sense of community, they feel more obligated to do a really good job which keeps the quality of the content really high. Duolingo community volunteers collaborate a lot together, and it’s important that the in-house team makes this as easy as possible for them to do. This is why the 3 phase structure to launch a course has been instituted. During each phase, the in-house leaders help volunteers along and keep things moving within the platform. “This is where the bulk of the content creation comes in. Their community goes in and translates sentences again and again to create the content.” This is all part of the product. “The average time it takes to create a course that is ready for beta is three months. During this time, volunteers spend an average of five hours per week participating in the community, and many spend much more time interacting and contributing.” They have to ensure that the volunteers’ time is well-spent, and so the in-house team takes care of the more technical aspects of course creation. During phase 2, courses open to beta learners who provide feedback. The contributors make the changes and keep building a better course. Feedback is given once the course is totally live. It’s always easy to give feedback and the contributors are given the tools they need to make the changes on Duolingo’s behalf. In this way, all parts of the process that volunteers help with is within the product itself. They can remain in that one environment and continue to chat with their team while they do so. One of the tricky parts of building a global content engine in so many different languages is just that: there are a lot of languages. Instead of making one big forum for all contributors, they’ve created language-specific chat rooms for volunteer teams so that members can comfortably communicate with each other around the course in one set language. This allows them to create camaraderie around the languages there. 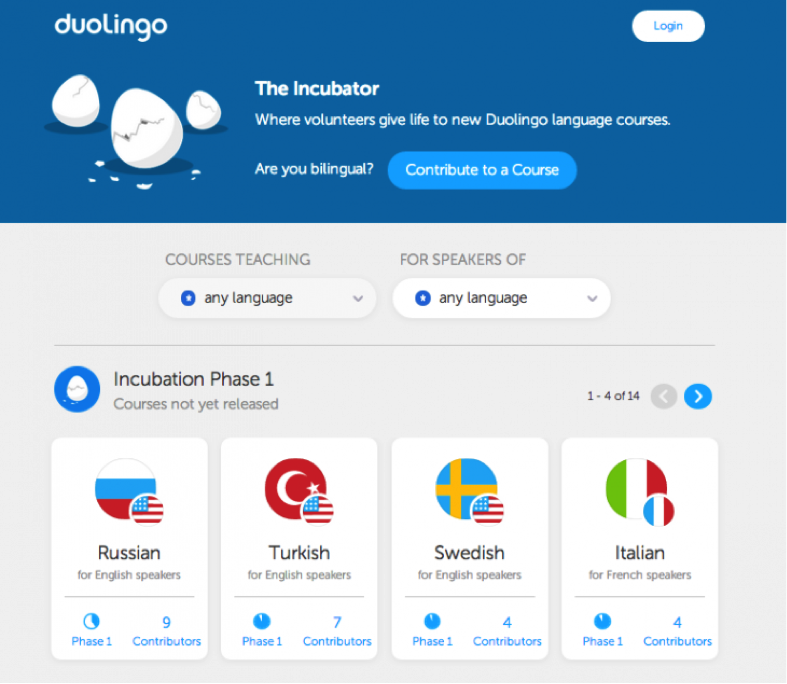 Outside of the Incubator, learners and contributors can also speak in the specific language forums on the Duolingo site, and then to go to the one main Duolingo discussion forum to have conversations around other topics. “We do everything we can to make the volunteer experience one that is rewarding and fun,” says Kristine. How do they maintain momentum to finish courses? Cooperation, not competition: One of the key engagement tools they use are the phases of course creation. Everyone works together to achieve the next phase, creating a cooperative model that incentivizes group work rather than individual contribution. When the group levels up, they level up together. With so many different cultures and languages, creating incentives can be tricky. What motivates someone in the US may not motivate someone in Russia or Brazil. However, the team has found that there are several keys to success when determining incentives. Recommendations: Volunteering time to build a new language course is a huge accomplishment. Offer recommendations for college, graduate school, or jobs. Learn what your community members’ larger goals are and find ways to get them there. Recognition: When you go to a course page, you’ll see the names of the volunteers that contributed to the creation of that language direction. 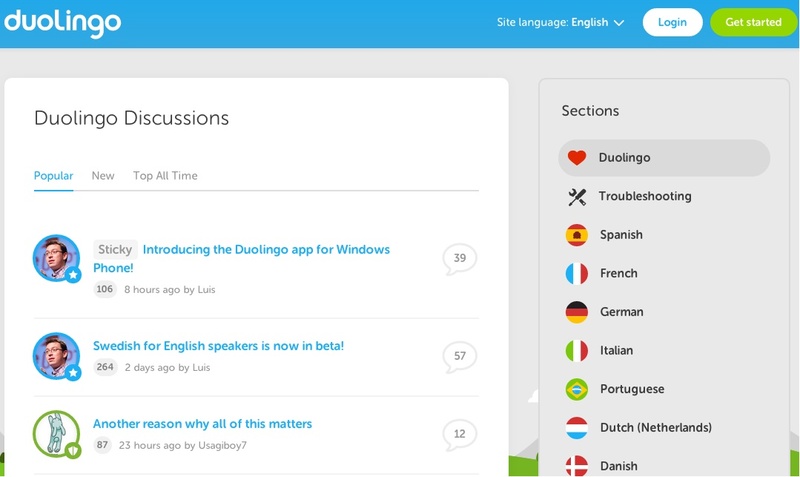 Giving back: In Duolingo’s case, people want to teach their language to others. This is a point of pride. Personal growth: Make sure people are learning along the way. On Duolingo, the process of course creation is an interesting technological challenge. People learn a lot about how language courses are built. There are many ways to incentivize participation, but the best ones that will spark the deepest engagement are the ones that are intrinsic or scalable: recognition, giving back, and growth. “We’re improving what’s possible technologically as well as through community,” Kristine explains. This is powerful stuff that is bridging the gap between product and community. 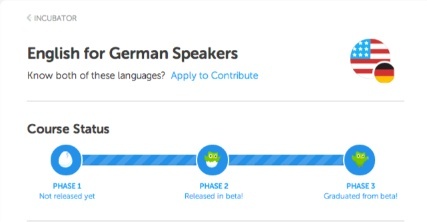 There are always challenges that crop up as you build a community from scratch, but Duolingo keeps approaching them head on as they think about how to build a global community around language learning that will last into the future.